little bird warmer. The temperature was 46 degrees F. when I took the photo on Sept. 10. A cold weather system, with gale-force winds, this season’s first frost warnings, and temperature highs in the 40s, was predicted to blow into Duluth in the evening on September 9. I’d had several hummingbirds using and fighting over my feeders for the previous week, and they seemed especially voracious on the 9th, perhaps noticing the dropping barometric pressure. An ant had somehow worked its way into my office window feeder and drowned on the 8th, and when I noticed it in the feeder at midmorning on the 9th, I opened the window and brought the feeder in to change the water. When I came back, one hummer was hovering in the open window. It didn’t fly away as I walked directly toward it and lifted the feeder—once I got the feeder within three or four inches of it, it simply maintained that distance, hovering backwards and sideways as I hung the feeder back up. The little guy was already drinking before I even let go of the feeder, much less closed the window. I thought most of my hummers would leave on the 9th, but at 6:30 am on the 10th, while it was still quite dark, a hummingbird started feeding at one of my feeders. In order to have found it in the dark, I’m assuming this one spent the night in my yard. All day I had hummingbirds—often two or three at the same time, sometimes engaging in brief chases. People used to ask me all the time about a “rule” they’d learned, and heard repeated on old TV nature programs, that we should bring in our hummingbird feeders by Labor Day or hummingbirds would linger too late into the fall and end up dying. This year, Labor Day happened to fall on September 1—the earliest date it can fall on. And this year, spring was considerably later than normal, delaying the breeding season for many birds, so if hummingbirds really did schedule their lives around federal holidays, they’d have had an exceptionally short window of time in which to complete all the essential tasks of raising young. Even with the brief breeding season, virtually all adult males and even most adult females had hightailed it out of here by the end of August, including both the adults passing through from further north and those that bred here. But on Labor day this year, at least a few breeding females were almost certainly still recovering from the grueling responsibilities of raising young, and a great many of the young that hatched out this year were still putting on weight and perfecting the life skills they needed before lighting out for the territory. With so many hummingbirds about and such cold weather headed our way, a lot of people are asking me about whether they should bring in their hummingbird feeders now. But the answer is a simple and emphatic NO. 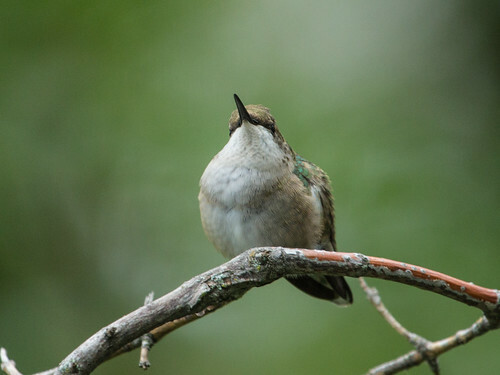 Ruby-throated Hummingbirds have a powerful migratory instinct. They leave, one by one, as soon as their bodies are in migratory readiness. Keep your feeders clean and the sugar water fresh. During cold, wet conditions, make the mixture a little stronger—about a third of a cup of sugar per cup of water. That may help any birds that had bad luck during the breeding season make it through these early cold spells. When temperatures rise again, at least some insects will become active again, and unless there’s a killing frost, flowers will still have some nectar. One by one, as soon as the birds have enough body fat, they’ll leave. Except for outliers that look completely different from others, it’s impossible to know which of our birds are sticking around for a few days to gain weight and which are grabbing a quick meal as they pass through, but hummingbird scientists and my own experience guarantee that the birds capable of migration will, indeed, head out as soon as their fat reserves allow. The trick will be to get enough food to build up those reserves. In a cold autumn, our feeders can make the difference between life and death for some of these irreplaceable birds. Thanks for posting this. It put my mind at ease about the hummingbirds still at my feeder. Here is Syracuse the weather is starting to get chilly. In past years, birds were long gone south by now. Why aren't they moving yet? I will keep the food out and fresh for a while. This year's summer was delayed, so young hummers had a late start. They WILL get going when the going gets good for them in terms of their fat deposits.